When the chips are down, Impact NW is always there. We are there for people who lose jobs or homes or find their lives derailed by illness or violence. For 50 years, this homegrown non-profit has rallied for neighbors, walking alongside thousands of people, caring for them and helping them get the support they need. Right now, we are rallying around one of our own. 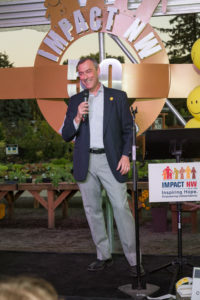 Jeff Cogen, Impact NW’s Executive Director, experienced a moderate stroke on July 21. He is recovering in a rehabilitation facility surrounded by friends and family. There is much hope for his recovery. The Impact NW community, like everyone, was saddened by the news. Yet, in the days since, we are doing what we do best: rallying for someone who needs us. Everyone is stepping up to make sure we stay on the course Jeff has set for us. We are also sending Jeff our best and preparing to support him in any way that he needs. As a testament to the many lives that Jeff has touched, we have received countless messages of support this week. We are encouraging anyone who has words of support for Jeff to send them through this form. We will pass them on. It’s the least we can do for someone who’s given so much to us. Meanwhile, we are stable here at Impact NW. This is a group of amazing community leaders who are really good at what they do. Employees are doubling down to make sure we keep services strong. Board members are stepping in to keep Impact NW vital. And so many volunteers and community members are offering their support. It’s been wonderful to see. There’s no timetable on Jeff’s return. In fact, we want him to take the time he needs. We are very optimistic about his recovery and look forward to the day when he brings his positive, charismatic self back to the office. Meanwhile, we are walking with him every step of the way.